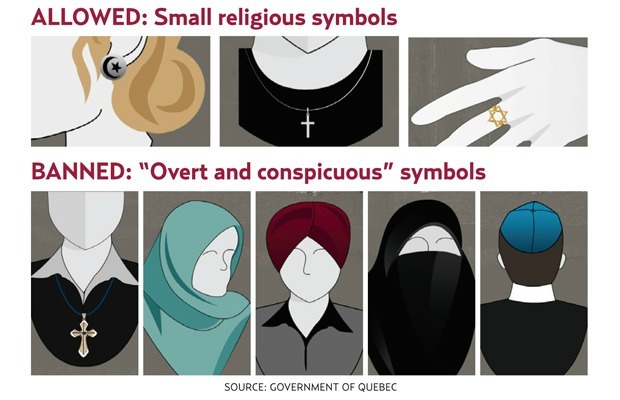 The Government of the State of Quebec have proposed an “Act Respecting the Laicity of the State”, known as Bill 21, that would prohibit public servants “in positions of authority” — teachers, police officers, Crown prosecutors, and prison guards, for example — from wearing religious symbols. In Ireland, Gardai will be permitted to wear head-scarves and turbans, it was recently announced. The Government argue that the law would be an affirmation of the separation of religion and state. Critics say it contravenes not only religious freedom, but also equality, as it doesn’t ban a Muslim man from wearing a religiously inspired beard, but does ban a Muslim woman from her chosen way of presenting herself. Nonetheless, polls show it has up to 75% popular support.